To achieve its core purpose, the Mahwah Municipal Alliance operates three ways. We fund programs, we partner with selected organizations and we search actively for new program ideas. All funds dispersed by the MMA are reviewed by our Board of Directors to ensure our Core Values are reflected and our financial resources are well spent. Through grants, corporate and private donations, and general fund raising efforts, the MMA raises monies, which are then used in several ways. Funds are granted to local organizations such as schools or sports or other community based groups typically to help offset costs incurred to deliver programs. For example, the MMA has made grants to several new, athletic programs such as Roller Hockey, Street Hockey and Lacrosse in order to help successfully initiate these activities. Theses types of organizations provide continuing opportunities for Mahwah youth to participate in activities typically over an 8 to 12 week period. MMA will partner with local organizations to help execute programs. In these situations, the MMA may provide funds as well as human resources and administrative support. Because the MMA is associated with the Mahwah Police Department, we are able to utilize the skilled expertise offered by the department in a variety of areas. 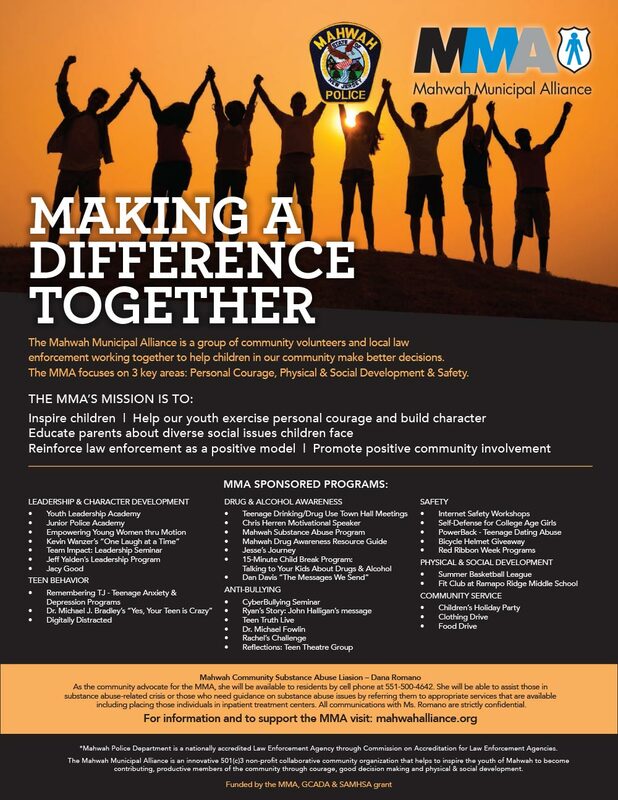 For example, the MMA has worked to deliver the Mahwah Substance Abuse Program to Mahwah’s school children since 1985. Similar efforts include the Mahwah Junior Police Academy and the recently launched Mahwah Youth Leadership Academy and CyberSafety. The MMA is always interested in new programs, projects, approaches or ideas which can be delivered to help illustrate for our youth the power of making great decisions. As a result, we actively seek new programs and feedback about those efforts we have provided assistance to previously. Please e-mail your Feedback and Suggestions to us to tell us what is working and what could be improved.